Seoul is located in the center of the country. And the surface area of Seoul is 605.522��, corresponding to 0.28% of the surface area of Korea. Seoul city consists of 25 districts and 522 dong. The population of Seoul amounts to 10,321,449 (in 2000). The City hall of Seoul is located in the street of Taepyeongro, Junggu, in Seoul. 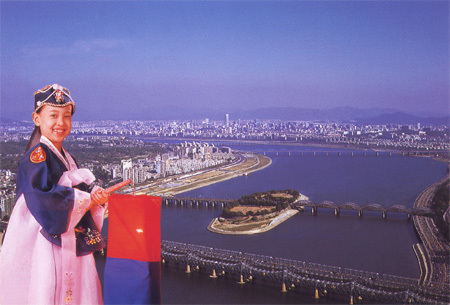 Seoul has been the capital of Korea since 1394, (3 years after the king of Taejo of Yi dynasty governed the country). Seoul has been the central city in the politics, economics, industry, society, culture and Traffic. The Seoul Olympic was hold in Seoul in 1988, and the World Cup as well as the meeting for Metropolis is going to be held in Seoul in 2002. Seoul becomes international city. Seoul is a sister city to 18 cities, such as Taipei, Ankara, Honolulu, San Francisco, Tokyo, Paris, Moscow, Cairo, Mexico City, Rome, etc. The flower symbolizing Seoul city is golden bell. As for the tree, the ginkgo tree symbolizes Seoul city, and as for the bird, Korean magpie symbolizes Seoul. Besides, Korean tiger in Korean folk tale was redesigned and the cartoon character of Wangbeomi, Korean tiger represents Seoul city.